A taste of the country - or a spot of car booty? Good enough for Rick Stein! One of the great advantages of living in Swindon is the expanse of idyllic countryside that surrounds us. 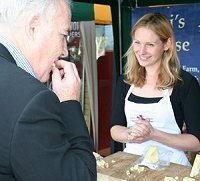 With all the local communities growing, rearing and processing local produce, the town is ideal for experiencing the distinct and special identity that a market provides. And now the opportunity to sample all that has been bred, caught, pickled, brewed and baked has never been better. So if a real flavour for the countryside and a chance to buy locally-sourced, fresh produce is what you are after, then look no further than SwindonWeb - we have all the information you need.